Our enemies are many. We have not just our foes to the North, South and East, but also the foes of plague, poverty, famine and, at times, the King himself with his relentless feasts while the kingdom buckles under its strain. Our people are too few and uneducated, and our resources are too scarce. But despite all of this, there is great hope for this kingdom. And that hope lies in every stone of the castle we begin to build today. If you listen closely, you may hear the sounds of change in the wind. That is the sound of fear in our foes, for they too know and fear what we are capable of. Come and build the towers, fill our coffers and light the torch of our glory. As the towers rise into the sky, that torch will glow brighter and brighter until we blind our foes and cast a shadow of the sun upon the earth. 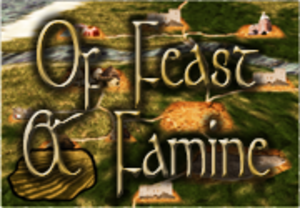 Of Feast & Famine is a co-operative game for 1 to 6 players. Each player represents a Minister in the service of King Cheshire. The object of the game is to build the castle for the King before the kingdom succumbs to disaster. And disaster comes in many forms. You will fight enemies to North, East and South, plagues, famines poverty and more.